This pdf clocks in at 2 pages and is a mini-dungeon. This means we get 2 pages content, including a solid map and all item/monster-stats hyperlinked and thus, absent from the pdf, with only deviations from the statblocks being noted for the GM. Oh, and the series now comes in an archive that also contains…*drumroll* a .tif-version of the map! Yeah, that’s pretty amazing! There is a little village called “Spinner’s Folly” – and it may be aptly named, for they have an…interesting local tradition: Thrice a year, nature-affine adventurers are invited to a local dungeon, the selfsame one depicted herein, and given an interesting task: Enter the dungeon known as the eponymous spinner’s hole…and subdue the giant spiders therein. You see, the local economy is relying completely on the giant spider silk, so killing them as per the usual adventurer modus operandi just won’t do. This also means that this level 1 adventure would make for an interesting “man/womanhood rite” type of introduction to the adventuring life. Within the dungeon, remnants of animal sacrifice, spider swarms and poison darts can be found and sheets of webbing as well as secret doors contain sections of the dungeon, providing some serious challenge. 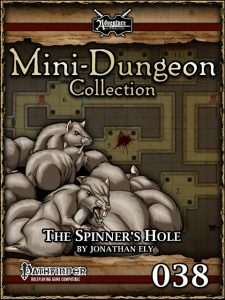 Jonathan Ely’s “Spinner’s Hole” is perhaps the most concise of his mini-dungeons that I’ve analyzed so far: On paper, it may not sound like much; the traps, for example, with their exclusive emphasis on poisoned darts, could be more diverse. In play, however, the module actually works really well. I used it as part of playtesting and the unique entry vector of the scenario with the emphasis on the odd, local economy/custom, alongside with the challenge of dealing with swarms at level 1 made this a fascinating module that turned out to be more fun than its very focused theme would lead you to believe. It is hence that I award this 5 stars.